Two wind advocacy groups, seeking to promote the use of wind energy, donated enough electricity to run the 10-day fair. SKOWHEGAN — The Skowhegan State Fair, which wraps up its 196th year Saturday with truck pulls and a country rock performance by the band Bad Penny, is being powered solely on wind energy this year after a donation by two wind advocacy groups. 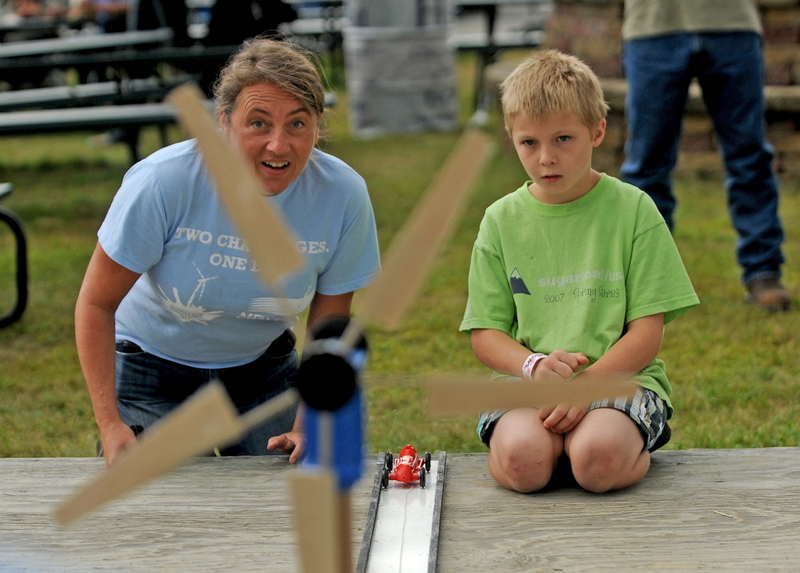 The advocates say the Somerset County fair, which attracts about 60,000 people during its 10-day run, is the perfect place to spread the word about wind as renewable energy. Wind also had a visible presence at the fair this year: large posters advertising wind energy, a create your own wind blade contest on Friday, and the use of wind energy itself. The Portland-based initiative, along with Wind for Maine, another group advocating for the use of wind energy, collectively purchased enough electricity from renewable energy generators to power the fair, which typically requires around 89,000 kilowatt hours of electricity. The cost of the power is expected to be between $6,000 and $7,000 when the electric bill arrives, according to Thomas Dillon, president of the Skowhegan State Fair. Dillon said he was approached a few months ago by the two groups about using wind power at the fair, at no cost to the fair organization. Dillon said he wasn’t sure whether the fair would use wind power again, but that so far there have been no glitches. The wind power is generated at various wind farms around the state, and the current produced is fed into the existing electrical power grid. As they generate energy, renewable energy facilities such as wind farms generate credits that can be purchased as a way of guaranteeing that the energy you are paying for comes from that facility. Electricity for the midway, the lights, communication services and other uses is still drawn from the electrical distribution system the same way as power generated by coal, oil, gas or nuclear power. But the renewable energy credit mechanism allows a user to designate its power supply as representing energy produced by wind farms, according to Williamson. In effect, it means the price of electricity goes back to the wind farm as payment for the power produced. In Maine, wind energy has been met with mixed reviews by advocates who say it will bring jobs and a source of renewable energy to the state, and opponents including concerned environmentalists and those opposed to disrupting rural character with the construction of large, potentially noisy, wind farms. There are currently more than a dozen proposals for wind farms around the state that are being considered or have recently been given decisions by the Maine Department of Environmental Protection. 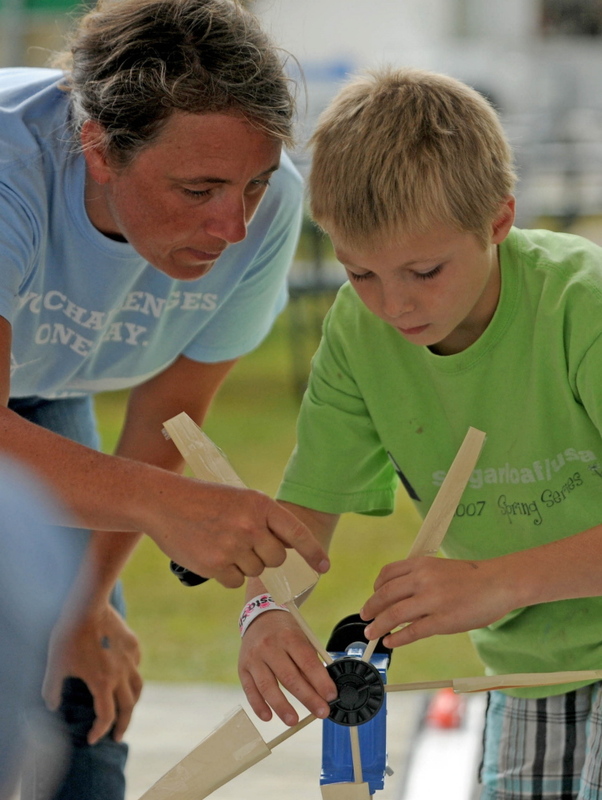 Tanner Mayo and Jocelyn Tyler, Wayne Mayo’s grandchildren, were participating in a build-your-own-wind-blade challenge, which required participants to build their own windmill using paper cups and construction paper for blades. Once a windmill was constructed, it was attached to a toy car and tested using a fan to see if the wind power could be used to pull the car. The purpose was educational, but also a way for families to have fun at the fair, said Aders Beal, a research assistant for the initiative. “We’re trying to get the word out about the benefits of wind power, but it’s also time for kids to have some fun with their families,” he said.